Plocamium sp., copyright Derek Keats. 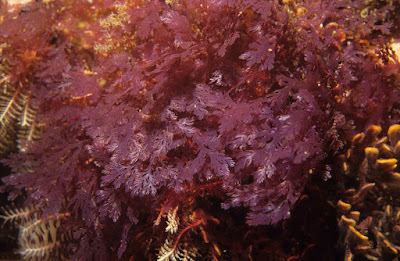 The Plocamiaceae is a family of red algae including the free-living Plocamium and its adelphoparasite Plocamiocolax. Characters (from Womersley 1994): Thallus (of free-living species) erect, complanately branched, with alternating marginal series of 2–6 compressed lateral branches or ramuli, axes sympodially developed, base stoloniferous (or parasitic and pulvinate); structure uniaxial, with a central filament surrounded by a pseudoparenchymatous cortex. Sexual thalli dioecious; procarpic. Carpogonial branches 3-celled, borne on mid cortical cells, with the supporting cell acting as the auxiliary cell. Carposporophyte outwardly directed, with a basal fusion cell producing several gonimolobes with all except the basal cells forming carposporangia, enclosed in a dense cellular pericarp; cystocarps sessile or pedicellate on the upper ramuli of the series, non-ostiolate. Spermatangia developed from surface cortical cells on upper ramuli or on branched tufts in their axils. Tetrasporangia borne in simple or branched stichidia on the margins of upper ramuli or in branched axillary tufts. Life history triphasic with isomorphic gametophytes and tetrasporophytes. [G05] Goldberg, N. A. 2005. Temporal variation in subtidal macroalgal assemblages at Black Island, Recherche Archipelago. Journal of the Royal Society of Western Australia 88 (2): 65–71. [HSA03] Huisman, J. M., A. R. Sherwood & I. A. Abbott. 2003. Morphology, reproduction, and the 18S rRNA gene sequence of Pihiella liagoraciphila gen. et sp. nov. (Rhodophyta), the so-called ‘monosporangial discs’ associated with members of the Liagoraceae (Rhodophyta), and proposal of the Pihiellales ord. nov. Journal of Phycology 39: 978–987. [L27] Laing, R. M. 1927. A reference list of New Zealand marine algae. Transactions and Proceedings of the New Zealand Institute 57: 126–185. [NLS03] Nelson, T. A., D. J. Lee & B. C. Smith. 2003. Are “green tides” harmful algal blooms? Toxic properties of water-soluble extracts from two bloom-forming macroalgae, Ulva fenestrata and Ulvaria obscura (Ulvophyceae). Journal of Phycology 39: 874–879. [S57] Scagel, R. F. 1957. An annotated list of the marine algae of British Columbia and northern Washington (including keys to genera). National Museum of Canada Bulletin 150: 1–289.